Monster hunting has been all the rage for years now. From Van Helsing to the Winchester brothers on Supernatural, we gravitate towards these heroes in every creative medium. 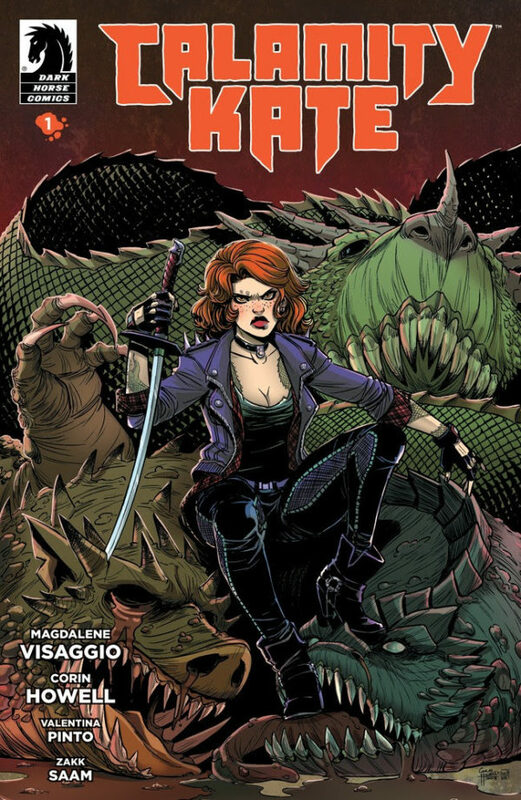 With Dark Horse Comic’s Calamity Kate, we get an over the top, celebrity status monster hunter with a charm all her own. From Magdalene Visaggio, Corin Howell, Valentina Pinto, and Zakk Saam, we get a very entertaining and intriguing debut issue. Kate Strand is going through a rough patch of sorts, knee deep in a divorce and trying to find herself again. But as Calamity Kate, she is one of the most beloved monster hunters around. When she heads off to visit her old friend Vera in Canoga Park, she brings her absurd antics and beyond crazy line of work with her. Monster hunting seems to be a thing in this world, and the media champion hunters like Calamity Kate. The book has such an exciting vibe to it. From the clashes with monsters to the hilarity that ensues when we see what a hunter does after the kill, we get a fresh new look into the world of monster hunters. What is Kate’s connection to Vera? Why did she stay away for five years? And with Kate taking on a momentous task to rid the world of the Seven Fabled Beasts, the beasts responsible for all the monsters on Earth, can she possibly win? Who else has the same plan? Visaggio crafts an excellent story, one with a heroine that is tough as nails albeit a little crazed. Howell’s artwork shines brightly in this violent new monster romp. This mature ages title is one that I would recommend to fans of Supernatural, Bitter Root or any of the great monster-themed books out there. Calamity Kate brings a new, fresh voice to the world of monster hunting, and I couldn’t be happier.